Some of the criticism came from the public health community, including board of health chair and city councillor Joe Cressy, who called the campaign "deeply disturbing, and potentially dangerous" in a tweet. But the city itself couldn't remove the controversial ads. 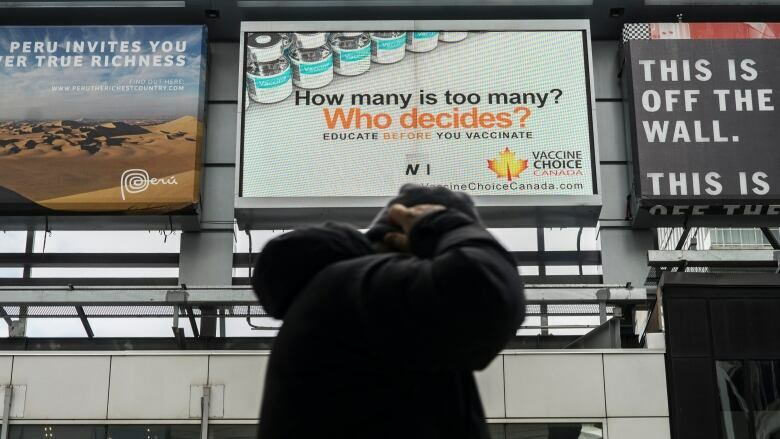 This week, a series of anti-vaccine billboard advertisements made headlines in Toronto, prompting concerns about their messaging and the impact on public health before being taken down. The billboard company received complaints and was "pressured to remove the ads," Ted Kuntz, a spokesperson for Vaccine Choice Canada — the organization behind the series of advertisements — told CBC Toronto on Tuesday. Some of the criticism came from the public health community, including board of health chair and city councillor Joe Cressy, who called the campaign "deeply disturbing, and potentially dangerous" in a tweet. But the city itself couldn't remove the controversial ads. That's because the content of sign advertisements is "not enforced" by the city's sign bylaw, said spokesperson Ellen Leesti in an emailed statement. That bylaw sets out regulations for signs used for business identification or advertising, and its purpose is to ensure signs are fairly and consistently used across the city. However, that's more about their size and location, not what's being advertised. The bylaw aims to make sure signs are appropriately sized for their surroundings, are properly installed, meet the standards of the Ontario Building Code, don't create traffic hazards, and don't have a negative impact on nearby public and private property, Leesti explained. So who does handle regulations and complaints surrounding the content? It's up to higher levels of government and a self-regulating body for the advertising industry, said Steve Szentesi, a Toronto-based competition and advertising lawyer. There's also "overlap" among those bodies, he added. On one hand, there's federal legislation, which generally prohibits false or misleading advertising, along with the Competition Act, which specifically prohibits false or misleading performance claims. "So if you're making health claims, or green claims or environmental claims that haven't been backed up by proper testing, you could be caught," he said. Then you have voluntary regimes like Advertising Standards Canada, the advertising industry's non-profit self-regulating body, which maintains a code for "acceptable advertising." When it comes to enforcement across Canada, Szentesi said there's the least amount at the municipal and provincial levels, with the bulk falling to the federal government. But while Toronto's local government doesn't have the power to act on the content of advertisements within its boundaries, the city-owned TTC does when it comes to billboards within the transit system. "Even though the TTC is considered public property, we do have the ability to review any ads that come in," said TTC spokesperson Stuart Green. "There are some pretty clear lines about what's acceptable by a community standard and what's not," he added. "We've drawn those lines in the past in terms of something that's perhaps sexually explicit or contains imagery of a violent nature." In the end, it's not clear if any government input contributed to the anti-vaccine ads being removed. A spokesperson for Outfront Media, the company operating the billboard platforms, did not comment on the reasons why it took the ads down, while Kuntz told CBC Toronto the company told him the ads were pulled due to "numerous complaints" through traditional and social media channels.